α, β - Unsaturated carbonyl compounds are the aldehydes and ketones that are conjugated by a double bond. Usually, a compound which includes both a carbon-carbon double bond and a carbon-oxygen double bond consists of properties which are features of both the functional groups. At the carbon-carbon double bond, an unsaturated ester or unsaturated ketone undergoes electrophilic addition of acid and halogen, hydrogenation, hydroxylation and cleavage at the carbonyl group; it undergoes the nucleophilic substitution typical of an ester or the nucleophilic addition typical of ketone. The carbonyl group of α, β - unsaturated aldehydes and ketones comprise of nucleophilic oxygen and an electrophilic carbon. Though, they as well encompass another electrophilic carbon-the β-carbon. 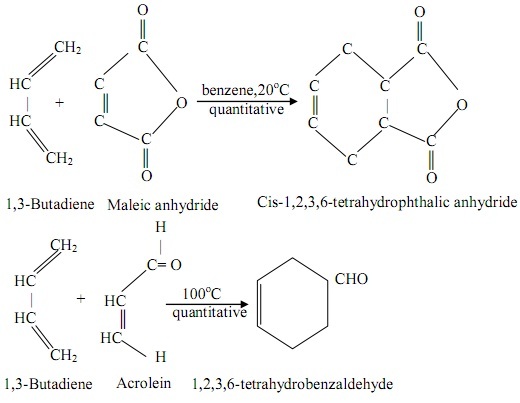 There are many ways to make α, β - unsaturated compounds: Aldol condensation for the unsaturated aldehydes and ketones; dehydrohalogenation of α-halo acid and the Perkin condensation for the unsaturated acids. The carbon-carbon double bond generally serves as the source of electrons for the electrophilic reagent. Though, the availability of its electrons is found out by the groups linked to it. An electron releasing substituent stabilizes the transition state leading to the initial carbocation through dispersing the developing positive charge whereas an electron withdrawing substituent destabilizes the transition state via intensifying the positive charge. 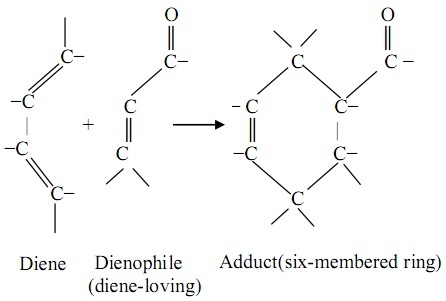 C=O, -COOH, -COOR and -CN groups are powerful electron withdrawing groups and thus would be expected to deactivate the carbon-carbon double bond toward the electrophilic addition. Due to this reason, α, β - unsaturated ketones, acids ethers are nitriles are usually less reactive than simple alkenes towards reagents such as bromine and the hydrogen halides. Though, such powerful electron withdrawing substituent at the similar time activate the carbon-carbon double bond towards the electron-rich reagents, therefore why α, β - unsaturated ketones, acid, ester and nitriles are susceptible to the nucleophilic attack. The carbonyl group of α, β - unsaturated aldehydes ketones comprise of nucleophilic oxygen and an electrophilic carbon. Though, α, β - unsaturated aldehydes and ketones as well have the other electrophilic carbon - the β-carbon. This is because the influence of the electronegative oxygen that yields in the resonance illustrated below. There are thus two electrophilic centers. As there are two electrophilic points, there are as well two nucleophilic points. Whenever the nucleophile reacts with the carbonyl carbon, this is a normal nucleophilic addition to aldehydes or ketones and it is known as 1, 2-nucleophilic addition. Though, if the nucleophile add to the β-carbon, then it is a 1, 4 - nucleophilic addition or the conjugate addition. The presence of carbonyl group lowers the reactivity of the carbon-carbon double bond towards the electrophilic addition and also controlling the orientation of addition. Usually the addition of an unsymmetrical reagent to α, β-unsaturated carbonyl compound takes in such a manner that the hydrogen becomes linked to the α-carbon and the negative group becomes linked to the β-carbon. Addition to α, β- unsaturated carbonyl compounds occur in such a manner as to form the most stable intermediate carbocation. Addition of proton to the compound might occur at either the carbonyl oxygen end giving the cation I or at the β-carbon giving the cation II. Of the two places, the addition at the carbonyl oxygen gives the more stable cation (I). In cation I, the positive charge is taken out by the carbon atoms alone and not partially by the more highly electronegative oxygen atom. The second step of the reaction comprises the addition of a negative ion or basic molecule either to the carbonyl carbon or to the β-carbon of the hybrid ion I giving mount to two possibilities- structures III and IV. 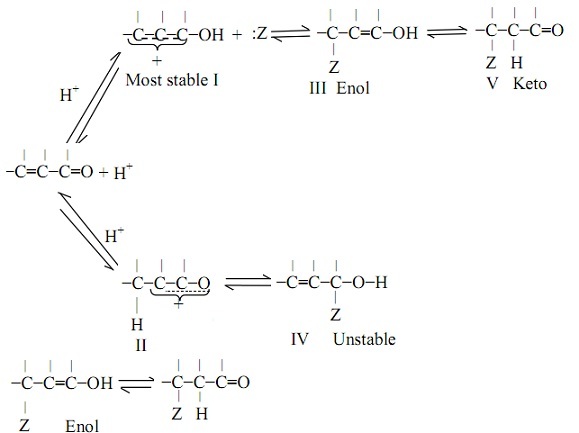 The addition to β-carbon is the one which results a stable product (III) that is the enol form of the saturated carbonyl compound. This will then experience tautomerization to the keto form to give the observed product (V). The 1, 4-nucleophilic addition is going to be the main focus here as 1, 2-addition is the normal addition to the carbonyl carbon as noticed in aldehydes and ketones. The given reactions are the illustrations of nucleophilic addition reactions. α, β-unsaturated carbonyl compounds are transformed to β-cyano carbonyl compounds if they react by aqueous sodium cyanide. The reaction comprises the addition of the elements of HCN to the carbon-carbon double bond. Ammonia and a few derivatives of ammonia such as amines, hydroxylamine, phenyl hydrazine, and so on, added to α, β-unsaturated carbonyl compounds to outcome β-amino carbonyl compounds. The nucleophilic reagent is added to the carbon-carbon double bond of α, β-unsaturated compound to outcome the hybrid anion I which then accept a proton. This is the special nucleophilic addition to α, β-unsaturated carbonyl compounds. This is of great synthetic significance and it outcomes in the formation of carbon-carbon double bond. Ammonia and primary and secondary amines are the powerful catalysts for the Michael addition. They assist to abstract a proton from the reagent to produce a carbanion and also to react by the carbonyl group of the substrate to make an intermediate imine or iminium ion that is very helpful towards the nucleophilic addition. It is the reaction between α, β-unsaturated carbonyl compounds having conjugated dienes. It comprises the addition of first and fourth carbon atoms of the conjugated diene system to the doubly bonded carbons of the unsaturated carbonyl compound to make a six membered ring. The reaction comprises a concerted single-step method. The Diels-Alder reaction is the most significant illustration of cycloaddition. This is known as a [4 + 2] cycloaddition as it comprises a system of four π electrons (that is, the diene) and a system of two π electrons (that is, the dienophile). The Diels-Alder reaction is very helpful as it generates a ring and as well as it occurs readily for a broad variety of reactants. The reaction is favored through the electron withdrawing substituent in the dienophile. Quinones are the special types of α, β-unsaturated ketones. They are cyclic diketones having a structure which make them convertible to hydroquinones and phenols through reduction. As they are highly conjugated, quinines are colored. Most of the properties of quinines yield from the tendency to prepare the aromatic hydroquinone system.